Lulu is adjusting very well to her new home, and we couldn't be happier with her! She may very well be the world's sweetest dog, and we love her so much already. Her favorite things are belly rubs, snuggling at bedtime, going on walks, and just being close to her people. She is easygoing, easy to live with, and very well behaved. She makes friends with every dog she meets on our walks, loves all people, and is gentle, patient, and affectionate with the kids. 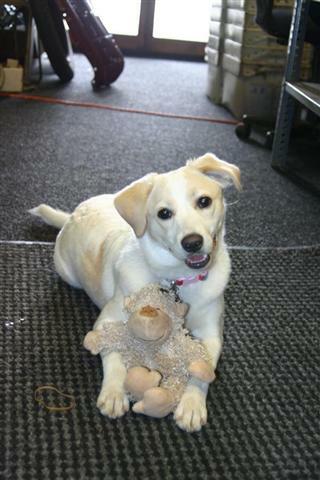 We feel incredibly lucky to have Lulu, and we are so grateful that you helped us find her. The loss would most certainly have been ours if we had not ended up with her in our lives. Thank you so much for matching us with her! I've attached some pictures of Lulu's first month with us so you can see for yourself how she has settled into our home and our family as if she always belonged here. 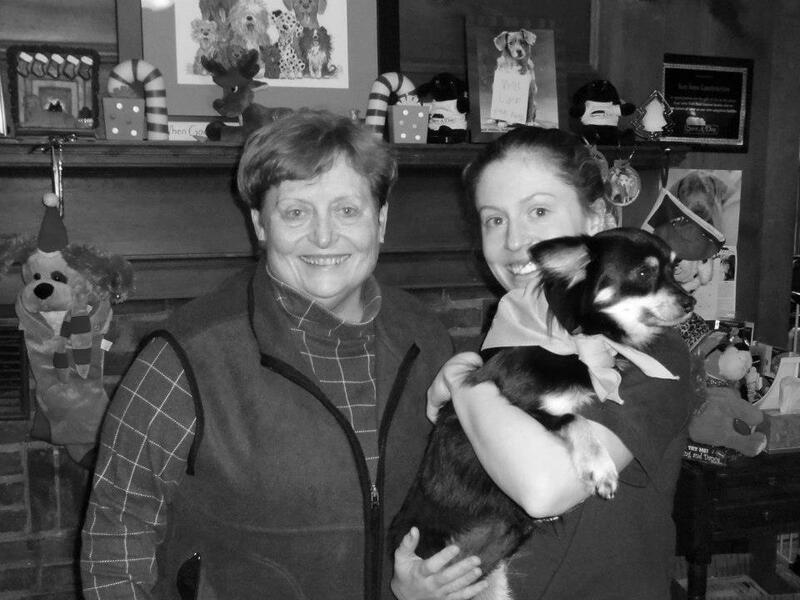 Jeannie and her daughter Bethany were missing something after their little dog Acorn passed. They wanted a little furry light in their life and they found it in Keebler. This little guy had a very rough start in life, including a broken front leg that was so badly damaged it had to be amputated. Just 4 weeks after the amputation Jeannie and Bethany fell in love with him and brought him home. 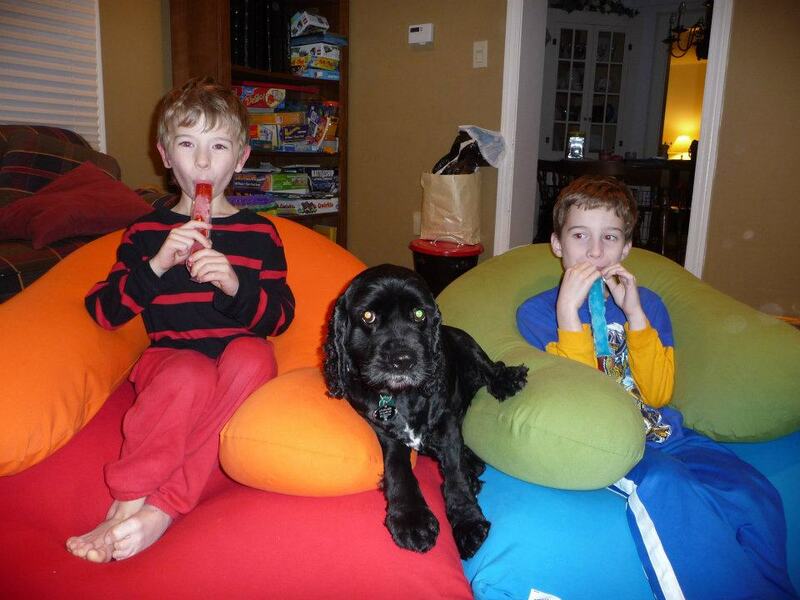 He has brightened their life and he has found his forever home with this happy family. They say that he doesn't even know he only has three legs and that he runs like lightning around their yard. "Ashley was a terrific find for us! We knew very little about dogs in general never mind what kind of dog would be a good fit for our house. Ashley spent a long time with us just getting to know us and what our expectations were for this new addition to our house. Our 15 year old was very motivated to find the friend she has waited “her whole life for” and never hesitated to send Ashley photos and questions about dogs she found at shelters on line. Ashley replied to EVERY one with why or why not these dogs would work for us. It didn’t take us long to find Sam. Since he has come home I have e-mailed and called Ashley multiple times for various new dog owner questions and she has been fabulous! If you know you want a dog but that is all you know I would highly recommend Ashley and Mutt Match to help you in every way to find the right fit for you!" After having had a bad experience with a shelter dog, I was hesitant to adopt another for my family. We knew we wanted a dog, but didn’t want to go through the heartbreak if this one didn’t work out. 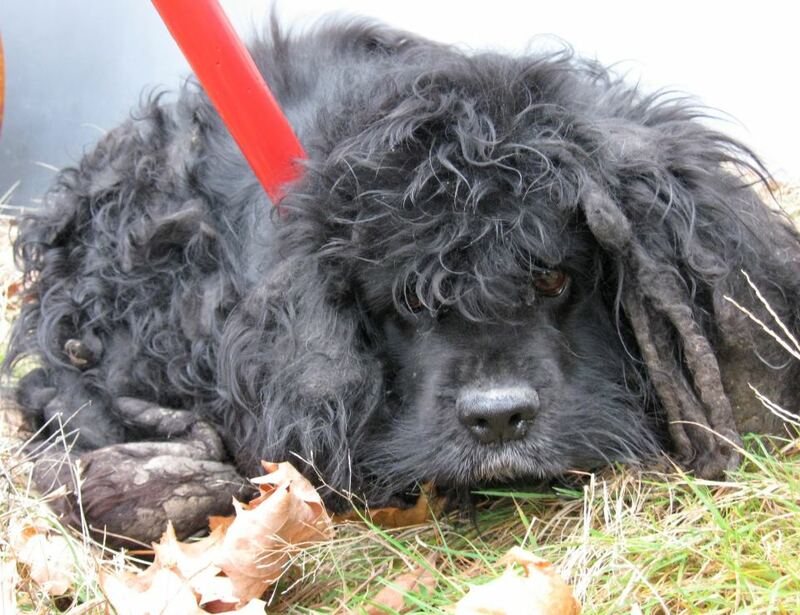 Well, we spoke with Ashley at Mutt Match, and she knew exactly what kind of dog we needed. 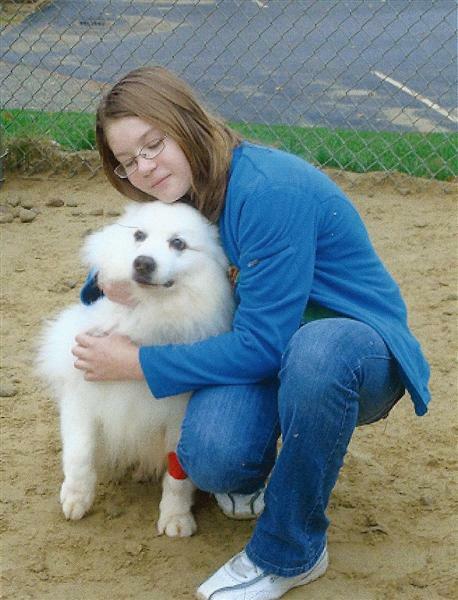 We’ve recently adopted Glazier, a ten year old American Eskimo whose owner passed away. He is such a wonderful addition to our family! He’s crate trained, house trained, and such a sweet dog. He is exactly perfect for our busy lifestyle. I’m a single mom and work full time. Weekends are usually busy, and I travel out of state frequently. He doesn’t mind being left alone during the day, and he’s happy when we come home from work and school. He’s also wonderful in the car. We have visitors frequently, too, and he’s great with everyone! Thanks to Ashley at Mutt Match, I was able to adopt a wonderful dog for my kids. He is a perfect match for our family! "Growing up every set of parents must enter the debate with their children as to whether or not to bring a pet into the household. Children beg and pleade, "please please please can we get a puppy!" My dad Steve was never afraid to say no, "we're just not animal people" he'd say. That never stopped my siblings and I from holding back. "We are responsible!" we'd say, "we're ready for a dog!" Thanks to Ashley Lang and her Mutt-Match company, we were finally able to convince our father otherwise. 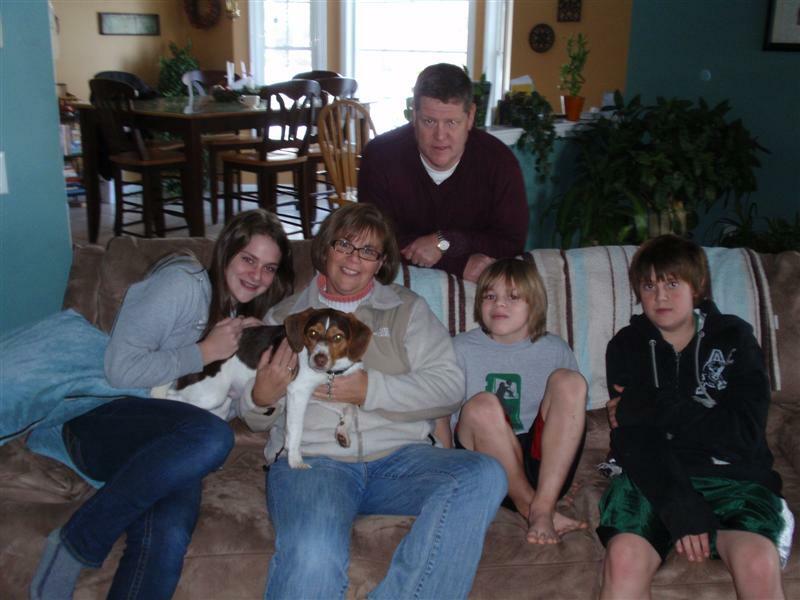 When my dad agreed to "look into" getting a dog, Ashley introduced us to a unique and comfortable process designed to guide us through a successful adoption. Ashley began the process by meeting with our family for a quick interview. We were asked a series of questions such as who was home at what time? how old we are? how much activity goes on in our lives, etc. She also inspected our home and neighborhood, specifically checking size, security and safety. Ashley's technique helped her determine size, age and breed of dog that would best suite our family and daily lifestyle. Immediately Ashley gathered her information and quickly and delicately entered the process of "mutt-matching." After choosing the appropriate breed of dog for our family, she sent us e-mails about dogs she had found who needed good homes. Every e-mail included pictures and short paragraphs describing the dog and explaining why each dog may be compatable with out family. Ashley had even taken time to go meet the dogs herself. Ashley made it easy for my family to sit and discuss which dogs we wanted to meet. This is when we met Sweetie. After seeing Sweetie's picture and reading her profile, we all knew it was time to meet her. Ashley took the time to contact Sweetie's caretaker and set up a date that worked her. my family and Ashley herself. The day we arrived we knew it was meant to be. All three parties discussed our living situation and introduced ourselves so that Sweetie's caretaker could get to know us as well. 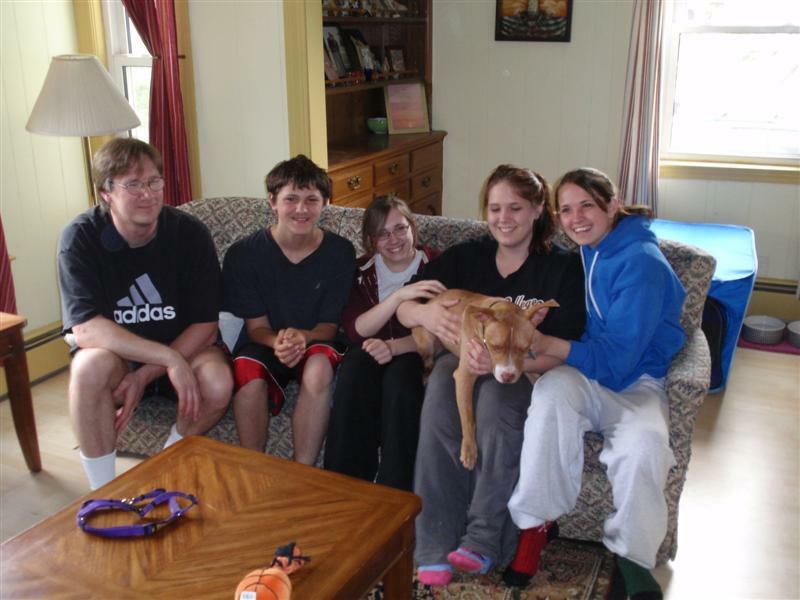 When all three parties agreed that we were a good family for Sweetie, we set up a date where Sweetie's caretaker could come to our home and arrange the adoption. The entire time Ashley remained aware of Sweetie's caretake's needs, and ensured that all three parties were comfortable with the ultimate descion. Sweetie has now been part of the Newsham family for about four months now. She is our sister, our playmate and our best friend. If dogs could speak human, i'm sure she'd say the same thing. We love Sweetie so much and there is no way we could possibly thank Ashley for her dedication to her work and love for animals that helped our family find Sweetie. For any family who is questioning the adoption of a new furry family member, Mutt-Match is the place to go. Ashley is efficent, caring, compassionate, honest and focused. We were pleased everytime we met with her, and were extremely impressed by her consistent updates and e-mails. We are extremely greatful! Mutt-Match is where it's at! Thanks Ashley!!!" Baylee is doing very well. He is such a wonderful little puppy!!!! We have been successful in house training him. We now have a bell on the door which he adjusted to very well. Still sleeping in his crate, although Jen is waiting for me to give the OK for him to sleep with her at night…not sure I want to go there, because I figure there is no turning back! I had taken him to a puppy kindergarten class in the fall. It was basic training – a lot of what you had already taught us, but good reinforcement. We have signed up for a six week obedience training starting this Sat to help us with some more training – getting better with “come” when there are distractions (like leaves and cars) and not taking off on us to venture through our back woods. He is definitely a people dog. Loves everyone! But not real keen on other dogs – very skiddish and tends to growl at some, but we are working on that one - I am hoping with more exposure to other dogs, he will learn they are not a threat! He even went and stayed with a neighbor (who has a dog walking service) over Feb vacation while we were away. I was so glad to have found her, as she was great to him and a comfort to us while we left him. He definitely has been a great addition to our family and we are so thankful we found you and that you found him for us!!!!! This is Kayla and Jasmine the Shitzu. 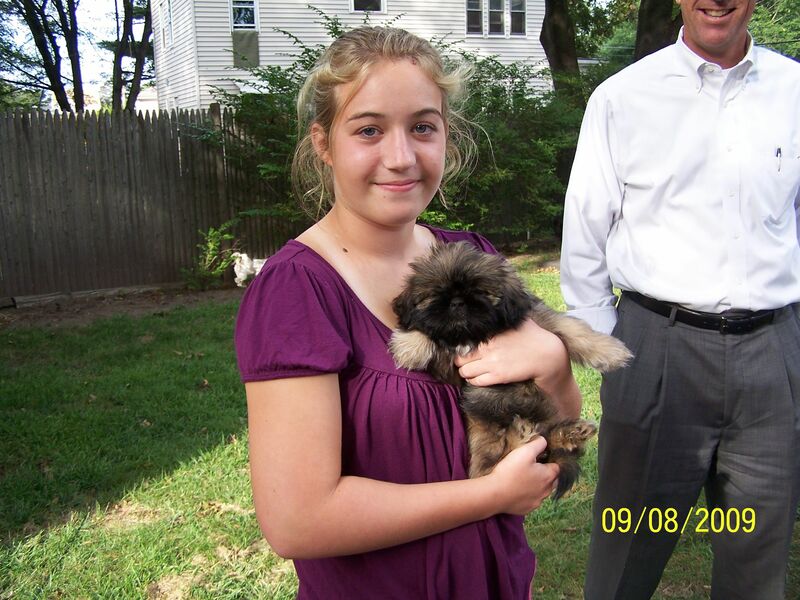 The family wanted a puppy that was hypoallergenic. Her mother loved Shitzus. We found a wonderful AKC Shitzu breeder that had one little girl left. 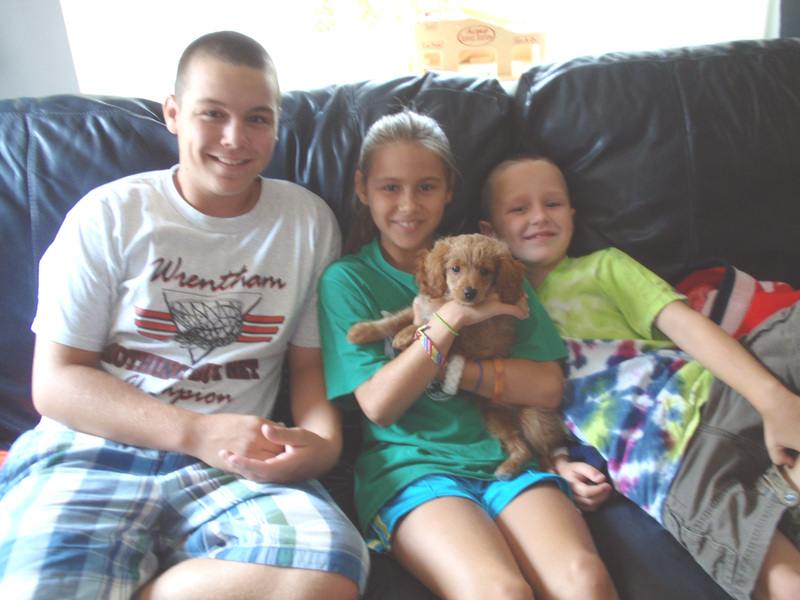 Jasmine has a great home and the Eastty family love their new member. 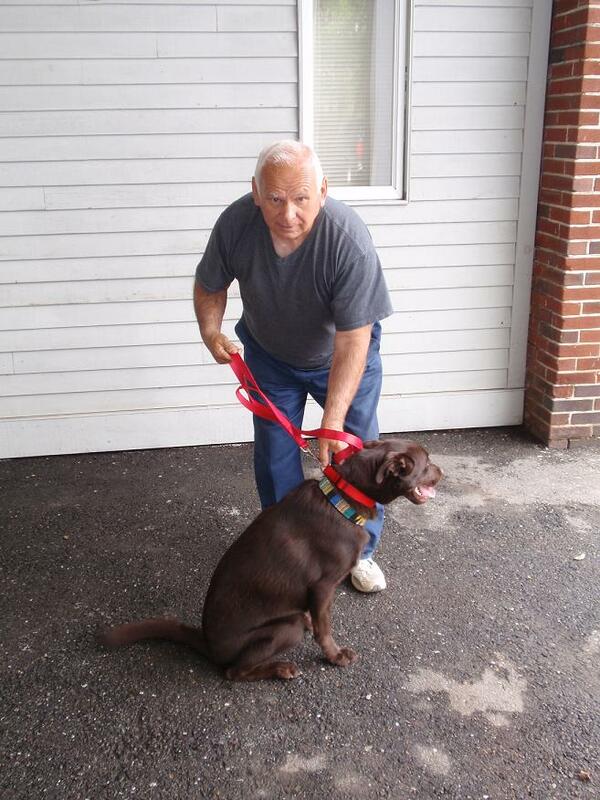 Joe and his Wife Mary just made a happy Mutt-Match. Mary was looking for a walking partner and Joe was looking for someone to keep him company during the day. They wanted a young lab, that was not too expensive. We found Coco here at a local shelter, and now she is with her happy new home!